Despite the remarkable emotional appeal and scientific value of old-growth forests, they are rare in Wisconsin. Only 0.3% ofWisconsin’s old-growth forests remain, but these scattered, small parcels still retain their ability to amaze hikers with their size, beauty, and elegance. The book is for a general audience, but its wealth of rigorously-researched and profusely-illustrated data may also serve as a general reference for professional ecologists and conservationists. Ancient forests are a topic of perpetual fascination for many of us, but amateurs and professionals alike frequently misunderstand these most senior of our woodlands. Enter naturalist John Bates. His extraordinarily detailed descriptions of Wisconsin’s old-growth forests lift the veil of mystery and provide us with glimpses of what the Badger State’s extensive pre-settlement forests were like. The book is a veritable goldmine of information on the sad destruction of Wisconsin’s original woodlands. Attitudes toward old growth, then and now, are explored along with an authoritative account of the biological and genetic diversity at risk when nature’s true woodlands are compromised. These accounts are followed by an extensive inventory of today’s old-growth remnants. 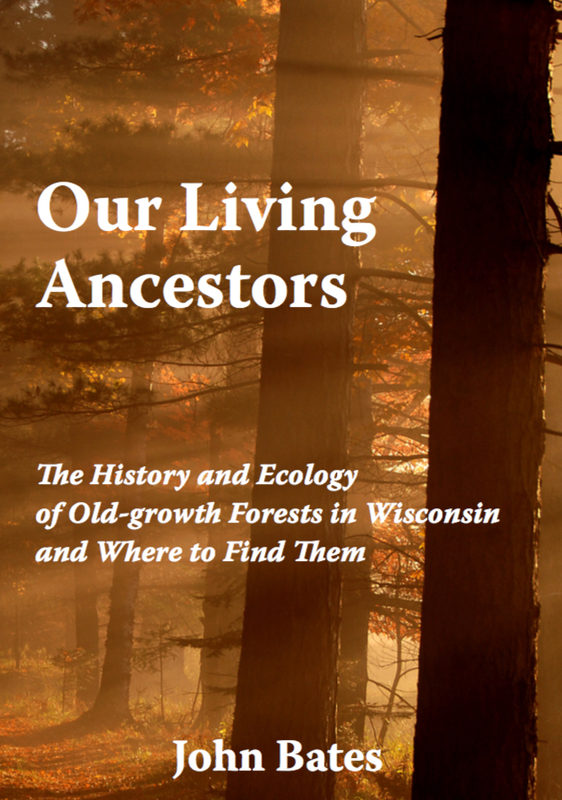 There is simply no better book written on these topics for a wide audience than Our Living Ancestor – The History and Ecology of Old-Growth Forests in Wisconsin (and Where to Find Them). No serious amateur or professional can be without it. This book is an ideal resource for anyone who wants to understand Wisconsin’s forests. It is extremely well researched, clearly presented, and masterfully written. Bates has turned what could be a dry subject into a lively, living, symphony of words. There is something for everyone here, whether you are an office-bound historian or a hiker who wants to experience the last remnants of wild ancient forests. Although every state could use a resource like this, it is one of a kind. I will keep it on my shelf within reach, and I believe that many decades from now people will still be referencing their copies of “The History and Ecology of Old-Growth Forests in Wisconsin.” John Bates has done us all a great favor by putting this important information together in one perfect package. - Joan Maloof, ​Founder and Director of the Old-Growth Forest Network, and author of Among the Ancients and Nature’s Temples. In one way or another we all depend on forests. Our understanding and appreciation of forests is more important today than ever and so is the critical need to restore and maintain old forests. Our Living Ancestors is a remarkable blend of the beauty, history and ecology of Wisconsin’s 16 million acres of forest. It is a captivating account of what our great forests were once like, and how they got where they are today. It is a comprehensive and easy read linking human dependence on forests over the centuries and into the future. This book should be required reading for all who depend upon and care about our amazing forests. What a wonderful book! The text combines deep insights into natural and human history with graceful writing, illuminating our understanding of Wisconsin's precious old growth forests. Combined with photos, sketches, and useful field information, this will be the perfect guide for those who love our forests. I can't wait to get out into the woods with my copy. - Nancy Langston, American environmental historian and author of Sustaining Lake Superior and Forest Dreams, Forest Nightmares: The Paradox of Old Growth in the Inland West. John Bates’ passion for old-growth forests comes through on every page of his wonderful book. Bates describes the fascinating biotic complexity that develops over centuries in old-growth forest, with snags and slowly decaying old trees, root mounds, molds and mosses all adding to the mosaic. Bates has spent years visiting the best old-growth forests that survived . . . and guides us to the best 50 sites with good maps and descriptions of what we’ll see and interesting stories of how these areas were preserved. Northern Wisconsin resident, naturalist, and author John Bates has written an important book on Wisconsin’s old-growth forests that not only presents material that covers new ground, but makes the often missing connections between past ecological and socio-economic events, and conditions in our current forests. The publication is well-illustrated with photographs (current and historical), maps, tables, and charts, and the text is peppered with great quotes from authors who have had thought about and are familiar with our complex relationship with the natural world. All in all, “Our Living Ancestors” makes for an engaging read, while presenting material that fills important gaps in Wisconsin’s natural history. I would note that a number of the photos, especially those depicting individual trees or groves, vividly display some of the effects of current landscape conditions. such as over-abundant deer and excessive browse, small stand size and isolation, and invasive species such as exotic earthworms. The trees are still there, and the forest canopy remains intact, but effective conservation is clearly becoming increasingly complex (even without the political considerations!). Experience Wisconsin’s history told though the annals of forests. Our Living Ancestors artfully captures the essence of woodlands and contains the most thorough documentation of old-growth remnants left in Wisconsin. A must read for the natural history enthusiast and professional land manager alike.